There is a rare type of story, one that strikes a chord deep within you and pulls forth the rawest of emotions. A Monster Calls is one of those stories. It is powerful in its anger, its grief and its love. How was it that what is ostensibly an illustrated children’s story left me sobbing and late for work? 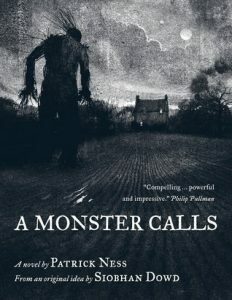 The perfect marriage of Patrick Ness’ acerbic prose and Jim Kay’s darkly atmospheric illustrations has a lot to do with it. Thirteen year old Conor has been having a nightmare. The same nightmare over and over again. Then one night at 7 minutes past midnight he is visited by a monster. The monster tells him that Conor called him, and that he will tell three stories. When those stories are finished Conor will have to tell the final tale, his truth. But Conor isn’t afraid of the monster, because he has bigger things to worry about, like why his mum seems to be getting sicker, and why no one seems to see him. It’s a story about grief and loss, about sickness and love, and most of all about fear and letting go. It broke my heart. The monster is a brilliant character, walking the line between advice-giver and change-maker with a dark but playful humour that gives this book the moments of lightness that make the darkness all the more gut-wrenching. Truth is a theme throughout this book, and it is explored with such tenderness that you can’t help but feel your heart clench for the characters. There are the lies we tell others, and the lies we tell ourselves. Almost all of the characters in this book are lying to themselves in some way, the adults and children alike. For me that is a big part of what make this book so powerful, and such an important one for young readers. Adults are not portrayed as good or bad, they are just as deeply flawed as the school bully and the best friend who betrayed a secret. If you want to be broken, to be rubbed raw, and be left gasping for air, then this is the book for you. Go and hug those you love. They may not always be here for you to hold.